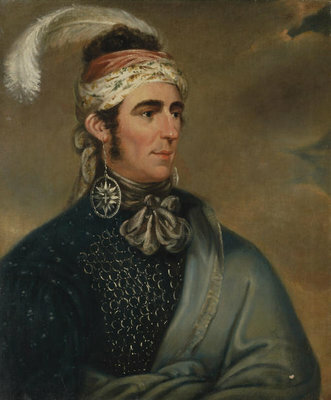 Image of Portrait of Major John Norton as Mohawk Chief Teyoninhokarawen, Oil on canvas. 30 x 25 in. by Mather Brown (1761-1831). The mixed blood son of a Cherokee father and Scottish mother, Norton was born in Scotland around 1770. Norton was especially inspired by the Mohawk chief, Thayendanega (Joseph Brant). Norton acquired Mohawk language and culture, and was adopted into the community as Thayendanega's nephew. He acquired the status of chief from his adopted uncle and was given the name "Teyoninhokarawen", which is Mohawk for "open door." He led Six Nations warriors into battle in Tecumseh's offensive against the Americans at Tippecanoe. With British commanders, he jointly led the successful offensive against American forces at Queenston Heights (for his part in the victory Norton was given the "Rank of Captain of the Confederate Indians", and went on to lead Iroquois contingents into battles throughout the War of 1812. At Chippawa, the Grand River Iroquois fought their New York cousins in a bloody confrontation. After this tragic event the Six Nations of the Iroquois decided to withdraw from the war altogether.